Join in the reading fun as Gwinnett County Public Schools officially launches its second Book Mobile. 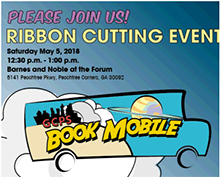 An official ribbon-cutting is part of a fun-filled weekend at the Barnes & Noble location in Peachtree Corners (5141 Peachtree Parkway), including performances by school groups (10 a.m. to 6 p.m.) and tours of the Book Mobile (noon to 2:30 p.m.) on Saturday. Duluth, GA- Paint Duluth is a pléin air adventure that will be celebrating its third year. The event is hosted by 2 Smith Art Gallery and sponsored by the City of Duluth and will be held May 9th-13th. Lawrenceville – Gwinnett Commissioners awarded nearly $22 million in resurfacing contracts for county roads last month. The Georgia Department of Transportation will pay for 29 percent of the contract cost. LAWRENCEVILLE — Gwinnett County Public Library will again join the Latin-American Association and Asian Americans Advancing Justice Atlanta to host free N-400 CitizenshipApplication Assistance programs for permanent residents at the Lawrenceville and Lilburn Branches.